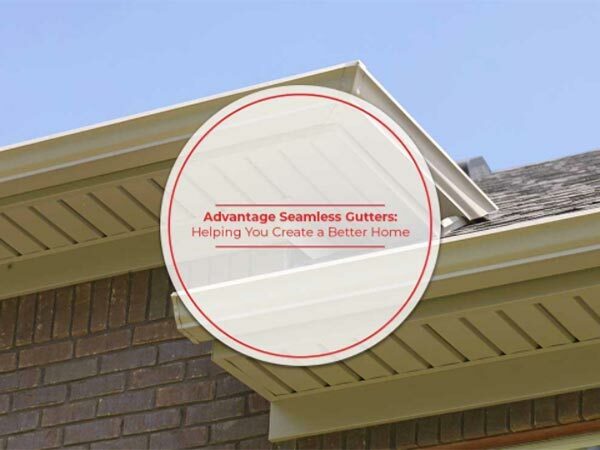 At Advantage Seamless Gutters, we’re the only local gutter company in your area that custom builds seamless gutters for homes. While we’re well-known for this speciality gutter service, we also have a proven reputation of helping homeowners improve their homes through our gutter services. In this post, you’ll learn how we can help you create a better home. Gutters that are blocked, clogged and poorly maintained are a danger to the rest of your home. Apart from their unsightly appearance, they won’t allow water to flow properly if clogged. Instead, water will spill over – often splashing the roof and the exterior walls. The worst that can happen is for the water to spill towards the foundation, which will pool and cause extensive structural damage. By taking advantage of our gutter cleaning services, you’ll protect your entire home from water damage. We’re proud to be among the select handful of local gutter contractors that offer custom-built seamless gutters. Unlike shop-bought sectional gutters, our seamless gutters don’t have any seams and gaps where water might leak and spill. Additionally, the seamless gutters we install respect your home’s architectural style. Consequently, they will protect your home and enhance your property’s curb appeal at the same time. Call us today at (218) 270-2663 to learn more about our home improvement services. We offer expert gutter cleaning throughout Baxter, MN and the surrounding areas including Alexandria and Crosslake, MN.